Though LIGO's response hasn't changed since the group started raising questions, a better understanding of the problem has emerged: are scientists doing enough to help others make sense of their data? A group of physicists in Denmark, which doubted last year whether American experiments to detect gravitational waves had actually confused noise for signal, has reared its head once more. The New Scientist reported earlier this week that the group, from the Niels Bohr Institute in Copenhagen, independently analysed the experimental data and found the results to be an “illusion” instead of the actual thing. The twin Laser Interferometer Gravitational-wave Observatories (LIGO), located in the American states of Washington and Louisiana, made the world’s first direct detection of gravitational waves in September 2015. The labs behind the observatories announced the results in February 2016 after multiple rounds of checking and rechecking. The announcement bagged three people instrumental in setting up LIGO the Nobel Prize for physics in 2017. However, in June that year, Andrew Jackson, the spokesperson for the Copenhagen group, first raised doubts about LIGO’s detection. He claimed that because of the extreme sensitivity of LIGO to noise, and insufficient efforts on scientists’ part to eliminate such noise from their analysis, what the ‘cleaned-up’ data shows as signs of gravitational waves is actually an artefact of the analysis itself. Scientists working with LIGO had rebutted Jackson’s claims back then. The fulcrum of their argument rest on LIGO data being difficult to analyse and that Jackson and co. had made some mistakes in their independent analysis. They also visited the Niels Bohr Institute to work with Jackson and his team, and held extended discussions with him in teleconferences, according to Ars Technica. But Jackson hasn’t backed down. 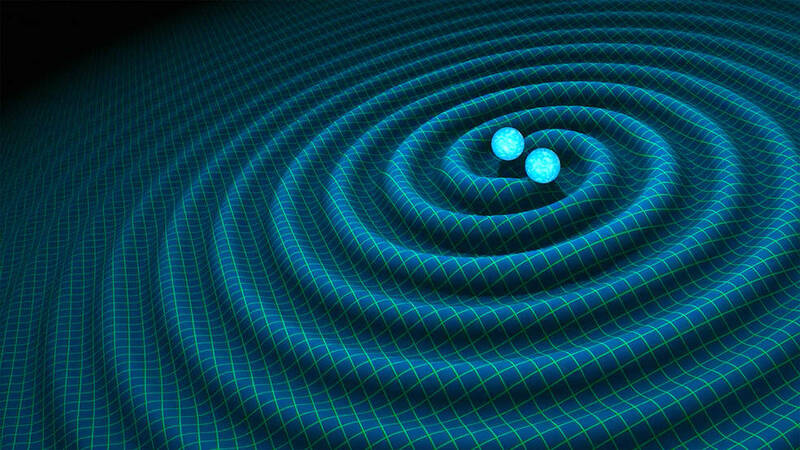 LIGO detects gravitational waves using a school-level physics concept called interference. When two light waves encounter each other, two things happen. In places where a crest of one wave meets a crest of the other, they combine to form a bigger crest; similarly for troughs. Where a crest of one wave meets the trough of another, they cancel each other. As a result, when the recombined wave hits a surface, the viewer sees a fringe pattern: alternating bands of light and shadow. The light areas denote where one crest met another and the shadow, where one crest met a trough. Each LIGO detector consists of two four-kilometre-long corridors connected like an ‘L’ shape. A machine at the vertex fires two laser beams down each corridor. The beams bounce off of a mirror at the end come back towards the vertex to interfere with each other. The lasers are tuned such that, in the absence of a gravitational wave, they reconvene with destructive interference: full shadow. When a gravitational wave passes through LIGO, distorting space as it does, one arm of LIGO becomes shorter than the other for a fleeting moment. This causes the laser pulse in that corridor to reach sooner than the other and there’s a fringed interference pattern. This alerts scientists to the presence of a gravitational wave. The instrument is so sensitive that it can detect distortions in space as small as one-hundredth the diameter of a proton. At the same time, because it’s so sensitive, LIGO also picks up all kinds of noise in its vicinity, including trucks passing by and construction work a few kilometres away. So analysts regularly have dry-runs with the instrument to understand what noise in the signal looks like. When they do detect a gravitational wave, they subtract the noise from the data to see what the signal looks like. But this is a horribly oversimplified version. Data analysts – and their supercomputers – take months to clean up, study and characterise the data. The LIGO collaboration also subjects the final results to multiple rechecks to prevent premature or (inadvertent) false announcements. Such analysis banks on its own field of study, called numerical relativity. Since the September 2015 detection, LIGO has made five more gravitational wave detections. Some of these have been together with other observatories in the world. Such successful combined efforts lend further credence to LIGO’s claims. The prime example of this was the August 2017 discovery of gravitational waves from a merger of neutron stars in a galaxy 130-140 million lightyears away. Over 70 other observatories and telescopes around the world joined in the effort to study and characterise the merger. This is why LIGO scientists have asserted that when Jackson claims they’ve made a mistake, their first response is to ask his team to recheck its calculations. But though their response hasn’t changed since Jackson and co. have started raising questions, a better understanding of the problem has emerged: is LIGO doing enough to help others make sense of its data? I think certain members – though by no means all – of the LIGO team have been uncivil in their reaction to the Danish team, implying that they consider it somehow unreasonable that the LIGO results such be subject to independent scrutiny. I am not convinced that the unexplained features in the data released by LIGO really do cast doubt on the detection, but unexplained features there undoubtedly are. Surely it is the job of science to explain the unexplained? From LIGO’s perspective, the fundamental issue is that their data – which is in the public domain isn’t easily understood or processed. And Jackson believes LIGO could be hiding some mistakes behind this curtain of complexity. … the issue for me was that the collaboration didn’t make an effort helping others to reproduce their analysis. They also did not put out an official response, indeed have not done so until today. I thought then – and still think – this is entirely inappropriate of a scientific collaboration. It has not improved my opinion that whenever I raised the issue LIGO folks would tell me they have better things to do. The features presented in Creswell et al. arose from misunderstandings of public data products and the ways that the LIGO data need to be treated. The LIGO Scientific Collaboration and Virgo Collaboration (LVC) have full confidence in our published results. We are preparing a paper that will provide more details about LIGO detector noise properties and the data analysis techniques used by the LVC to detect gravitational-wave signals and infer their source properties. A third LIGO instrument is set to come up by 2022, this one in India. The two American detectors and other gravitational-wave observatories are all located on almost the same plane in the northern hemisphere. This limits the network’s ability to pinpoint the location of sources of gravitational waves in the universe. A detector in India would solve this problem because it would be outside the plane. Indian scientists have also been a significant part of LIGO’s effort to study gravitational waves. Thirty-seven of them were part of a larger group of physicists awarded the Special Breakthrough Prize for fundamental physics in 2016.